TSCM Group – What Is Included In This Group? Technical surveillance counter measures are better known within the industry as TSCM. These measures encompass a wide range of services and tools used to interfere with the activities of someone trying to invade your privacy. Read on to find out more about the TSCM group, and when and where their services might be needed. Surveillance of an individual or company can take many forms, from physically watching and tracking them to using various electronic equipment to watch, listen to and record their actions and communications. A TSCM service will match the measures they use to the type of technology being deployed. This is one reason why, if you think you are under observation, you need to give the private investigator you hire as much information on the problem as you can. The majority of electrical devices used to spy on someone run on radio waves. In these cases, the counter surveillance expert is likely to use a radio frequency receiver to search for the source of such attacks. However, a good working knowledge of such counter measures is needed to determine the difference between the RF of a bug and that of a household appliance or even your mobile phone. Other tools in the group detect the magnetic fields of bugs that do not use radio waves. These are of use where digital recorders are being used. A further alternative used during a bug sweep is a thermal camera. These detect residual heat from devices or from their power supplies. All of these, and the many other tools that make up the group, are only half the equation, the other half is the combination of skills and experience of the TSCM operative. If you need the services of a team with the most expansive and up to date TSCM group, then you want Advanced Sweeping. Our team are highly trained and experienced operatives with a keen eye for detail. 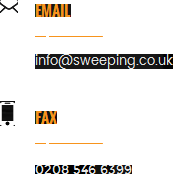 Find out more at http://sweeping.co.uk/ or email your concerns to info@sweeping.co.uk and we will respond as soon as possible.